All packaged foods and beverages in the U.S. have food labels. 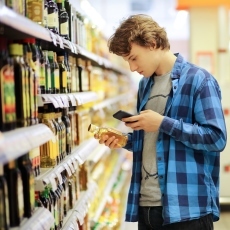 These "Nutrition Facts" labels can help you make smarter food choices and eat a healthy diet. Number of servings tells you how many servings are in the container. Some labels will give you information about calories and nutrients for both the whole package and each serving size. But many labels just tell you that information for each serving size. You need to think about the serving size when you decide how much to eat or drink. For example, if a bottle of juice has two servings and you drink the whole bottle, then you are getting twice the amount of sugar that is listed on the label. Percent daily value (%DV) is a number that helps you understand how much of a nutrient is in one serving. Experts recommend that you get certain amount of different nutrients daily. %DV tells you what percentage of the daily recommendation you get from one serving of a food. With this, you can figure out if a food is high or low in a nutrient: 5% or less is low, 20% or more is high.